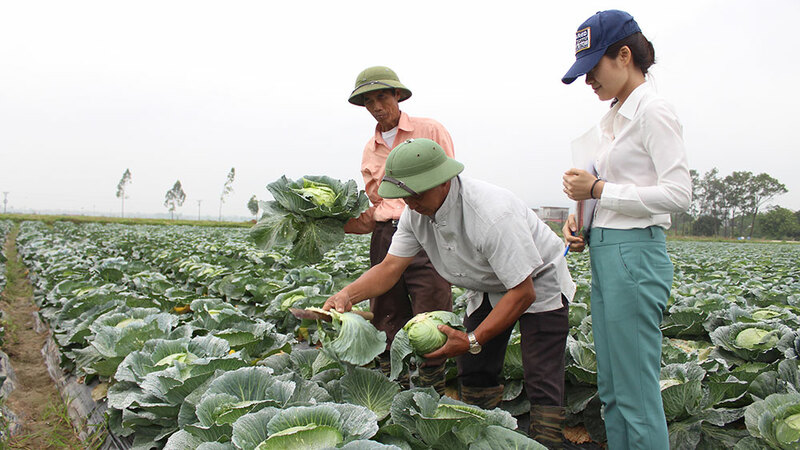 (BGO) – Meticulous selection of seedlings, strict cultivation process, product labeling and close connection between production and consumption have been put in the first line of the Yen Dung clean vegetables cooperative’s measures to develop the collective brand. Traders purchase vegetables of the Yen Dung clean vegetables cooperative in Tien Dung commune. We were taken to a concentrated vegetable growing area in Tien Dung commune by leaders of the Yen Dung clean vegetables cooperative. Right in front of our eyes are flat and extended fields with a wide range of vegetables waiting for being harvested. Separating a cabbage from its bed, Ong Khac No, an agronomist with experience in cultivation, said: “Along with quality seedlings, production process must strictly follow VietGAP standards like using fertilisers and plant protection chemicals in the list permitted for vegetables, uncontaminated water, taking note of specific time when the plants are fertilised. The vegetables, depending on different kinds, must be isolated 15-20 days before harvest”. The Yen Dung clean vegetables cooperative was established in 2016 and a production zone was set up in an area of 30 hectares in the three villages of Huyen, Chua and Dong Thang of Tien Dung commune. This is a key clean vegetable area chosen by the Yen Dung provincial People’s Committee in order to implement the instruction of the Standing Board of the provincial Party Committee to put forth high-tech application into agriculture production. The cooperative mobilised 40 households to contribute and lease their land for a long period. They are also members of the cooperative with average wage of 5-6 million VND per worker per month. The farmers have opportunities to get access to advanced cultivation methods. After one year of operation, the cooperative introduced their quality products to the market, including cabbage, cauliflower, pumpkin, loofah, cucumber and spice vegetables, among others. To improve the post-harvest quality of its vegetables, the cooperative is building a 5,000-hectare poly house and a farm produce processing facility. It has also installed with an automated watering system on a trial basis and set up a showroom for promotion of farm products. In addition, the cooperative has made its own labels and packages and put stamps of origin on its products before distribution. The business is quite good at the moment as their products are purchased by many companies from Hai Duong, Bac Ninh, Hanoi and more. Yen Dung Safe Vegetable Cooperative staff guide farmers to farming techniques. From 2017 – 2020, Yen Dung district aims to develop nine safe vegetable farms that promote links between production and distribution, covering an area of 80 – 90 hectares in the communes of Tien Dung, Canh Thuy, Xuan Phu, Dong Viet and Yen Lu, with Tien Dung selected as a pilot unit. At the same time, the district has been directing authorities of communes and towns and relevant local agencies to coordinate with the cooperative to encourage farmers to contribute farming lands for joint production; together upgrade inter-farm roads and canals; raise funds for purchases of machinery and equipment, provision of technical training and set tight control on cultivation to ensure the vegetable quality. On the other hand, district authority will increase inspection and supervision of vegetable production on the observance of legal provisions on food safety in an effort to protect and develop their brands. The National Office of Intellectual Property of Vietnam from the Ministry of Science and Technology has recently granted a collective trade mark – Yen Dung Safe Vegetables – to the cooperative. 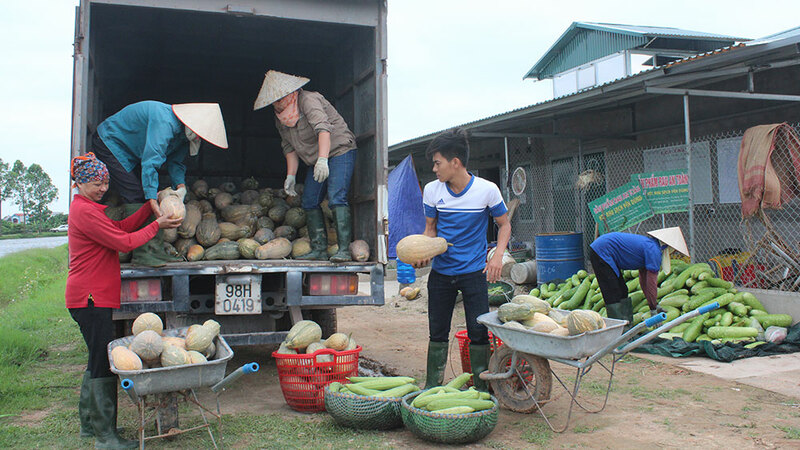 Hoang Huu Lan, deputy head of the district’s division of agriculture and rural development, estimated the district brings to the market dozens of tonnes of vegetables daily. The collective trade mark plays an important role in the district’s strategy to develop and expand safe vegetable production in the coming years.